The roof was being installed.. Here a few photos of a recently completed yard shed/garage. 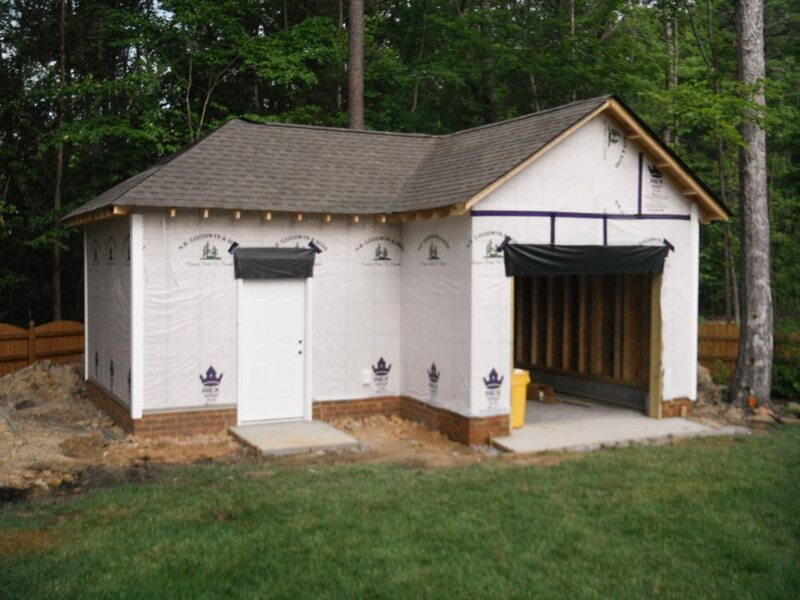 This project has a of the features of a traditional garage which include a matching masonry foundation and a concrete slab. Framing for this project compliments the decor of the home with a combination of hip and gable roof designs. Siding, cornice and roofing were color matched to the home. An 8′ x 7′ garage door was installed on the front for easy of access for wood working projects. Contact us for a free consultation on your next garage project. Visit our contact us on the website and we will be back to you as soon as possible. Also, visit our Garages Section of the website to see examples and our finished jobs. Click here to get a quote. RBM finished our attic, adding a bathroom, and closet for our son’s new bedroom, with space left for storage! Great job! – Portia M.
We used RBM Remodeling Solutions to build a pavilion on our pond and would just like to say how much of a nice job they did. Very courteous and great quality job performance. The best in the business. I would highly recommend them to anyone. My family and I have used Roger and Scott for multiple major projects. We have received nothing but quality work and great customer service. – Cory S.
We are extremely happy with the three big jobs RBM has done for us, including roofing, siding, replacement windows, master bathroom addition, and now a back porch addition. We have wholeheartedly recommended RBM to friends and family and will certainly call upon them again as the need arises. – Linda D.